The Cleto Munari Company was born in the early 70s, starting off with the production of its first design objects created by the greatest names in the architecture of that time, such as the well-known Gio Ponti. 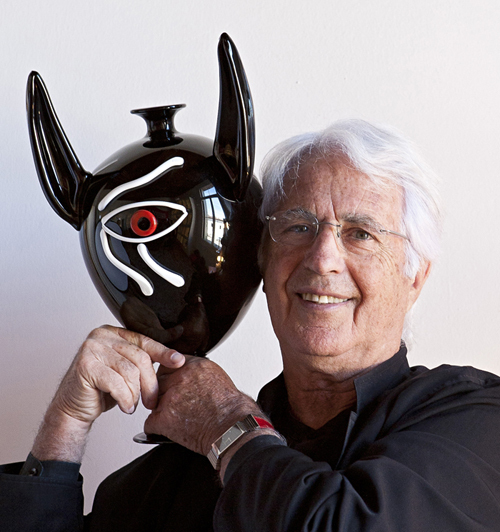 The years from 1970 to 1980 were very important to founder Cleto Munari himself in terms of stylistic research, which led to exploring new artistic forms of expression, in close collaboration with architects, designers and artists from all over the world in the creation of objects for everyday use. Cleto Munari had the chance to meet and work with many important people. We should at least mention the great “maestro” Carlo Scarpa, and a good friend, the architect Ettore Sottsass: it was they who inspired Cleto Munari, and from them he inherited his aesthetic taste for beautiful things from them, and over the following years he would become a key figure in the design world himself. For that matter, forging relationships and friendships with international artists and designers has never ceased and in the following years it became a constant trait of the way the company works and creates, and it has actually proved to be one of the most distinguishing and fruitful marks of the Cleto Munari enterprise over the years. At first, the Cleto Munari Company mainly focused on luxury goods, that is silverware, jewellery, watches: at that time such sectors had not yet found forms of expression suited to the enormous social and cultural changes already taking place in those years. Soon glass, ceramic, writing, furniture, carpet, leather objects would follow, too. It is also important to highlight that the Cleto Munari Company has always stayed faithful to its origins and asked for the assistance of artisans from the Veneto region with its productions, as those local artists are true masters at working with precious metals, glass, ceramic, leather and many other materials. Such an orientation has resulted in great benefits for the Cleto Munari Company: since it works in a completely local environment, all productive stages can be supervised closely, step by step; this in-depth observation has allowed the Cleto Munari Company to learn and absorb those techniques and specialized skills that are so crucial during both planning and production phases. The first “Silver collection” dates back to 1982, and it boasts designs by Gae Aulenti, Mario Bellini, Carlo Scarpa, Ettore Sottsass, Vico Magistretti, Hans Hollein, Alessandro Mendini and other great artists. This collection immediately proved successful, so much so that it was exhibited to the public in the most important contemporary art galleries and museums all over the world, and it entered the permanent collections of the Metropolitan Museum of Art and MOMA in New York, just to name a few. As for Carlo Scarpa’s silver cutlery (1978), the Cleto Munari Company had to wait over four years to obtain the great Venetian maestro’s designs; but the results were well worth the wait, and this lineis still today one of the productions Cleto Munari feels personally attached to the most still nowadays. After the Silver Collection, a “Jewel Collection” followed in 1985, with about 250 precious masterpieces, once again designed by great architects from all over the world. To mark the occasion, touring exhibitions were held in the US and Canada starting in 1987, and going on for two years; later Europe and Japan would host such exhibitions, too. Nowadays it still draws the attention of collectors and critics, who look at it as one of the most important Collections of Contemporary Jewels. Many of its jewels are shown in the permanent collections of museums all around the world. In 1987 a “Watch Collection” appeared. There are very few pieces, and they are themselves gold and diamond architectures to be worn, made by four great architects, each one of them representing a different culture: Ettore Sottsass for Italy, Hans Hollein for Europe, Michael Graves for the United States of America and Arata Isozaki for Japan. Now these watches belong to the permanent collection of the Metropolitan Museum of Art in New York. In 1990 a strong fascination with the Glassmaking Art of Murano bloomed. In the following years this passion would lead to the creation of “Glass Collections”: the authors were invited to experiment with new forms, which would later be brought together into various collections, among which “Micro Macro”, “Chromatic Transparencies”, “Corolle d’Autore” (‘Auteur Corollas’) and more. In 2002 the “Veronese Glass Collection” was born with the aim of gathering together the different interpretations of 10 artists, as well as Cleto Munari himself, on the theme of the famous glass vase called “Il Veronese”, a glasswork that has always been considered one of the most representative of Murano art. The authors engaged with this project were: R. Meier, M. Fucksas, A. Mendini, M. Thun, M. Paladino, P. Portoghesi, D. Palterer, M. Botta, B. Sipek, C. Nason and, of course, Cleto Munari. The production was limited and numbered to only 49 pieces. In 2004 it was the turn of “The Five Pens Collection”: this cultural project involved Cleto Munari and four more architects, together with five Nobel Prize Winners for Literature, in making five fountain pens. A book goes with each pen, retelling the emotions the Nobel Prize Winners still feel nowadays whenever they write holding these small treasures in their hands. It was during this project that the Cleto Munari enterprise developed an important conviction: ‘great’ artists do not have to limit their creativity to one discipline, but they actually could and should express it freely and strongly in other different artistic forms as well. 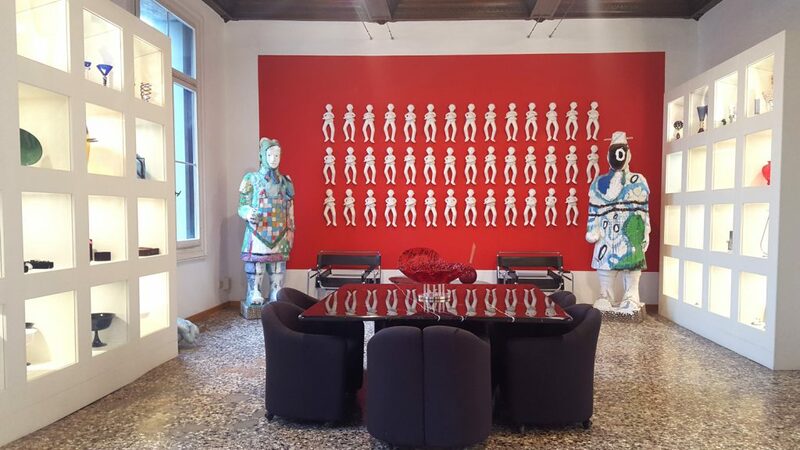 The “I Magnifici 7” (‘The Magnificent 7’) “Tables Collection” was born in 2008 and, as the names implies, it boasts seven tables, plus an eighth by Cleto Munari himself. For the first time architects, designers and artists worked togethed with leading figures in literature: Mark Strand, winner of the Pulitzer Prize; Dario Fo, awarded with the Nobel Prize for Literature in 1997; Lawrence Ferlinghetti, an internationally acclaimed poet and writer who founded the literary movement “Beat Generation” in the 1950s. The following year brought the “Furniture Collection”. Its first pieces (tables, sideboards, bookcases, containers and so on) were a limited production with only nine unique pieces, designed by Mendini, Mimmo Paladino and Sandro Chia. Later more furniture pieces have been added, and this line has been growing and developing up to today: they are creations by different architects, artists, big names collaborating together on one same project about furniture development, under the name of “Ars Vivenda”. This vein of production aims at a new form of artistic expression which literally ‘enters’ our lives and becomes a part of them, transforming our daily actions and gestures — such as opening a wardrobe door — in rituals that makes us feel as though we were part of an artistic masterpiece. It is an art which is supposed to be lived, and not merely admired. We could try to grasp its meaning with names such as “ars vivenda” (‘art to be lived’, in Latin) or “articipate” (‘participate in art’); anyway, whatever you call it, it will always stir your deepest emotions as you are at the same time enjoying and performing such a magical artistic experience as you enjoy such a magical experience. In chronological order, the last artist who has just joined this project is Luigi Mainolfi, from Turin. He has designed three furniture pieces for the Cleto Munari Company: they are actually sculptures recalling the main themes of his artistic production. One year later a “Carpets Collection”, under the name of “Art Carpets: Cleto Munari and friends”, assembled about thirty models of carpets: they were completely handmade in wool and silk, in Turkey, according to the most ancient traditional manufacturing techniques. The Carpets line is a limited production, with only twentynine pieces for each design model. The year 2014 marked the beginning of a new passion, that for leather. This project offers a line of bags with bright colors and metal accessories portraying the “Fist” and the “Eye of Isis”, two of Cleto Munari’s favorite symbols, which thus represent the main themes in this strongly Munari-oriented series. With the year 2016, Cleto Munari himself experiences a new burst of creativity, rediscovering his love for jewels. There are about one hundred jewels: some were designed years ago, others are very recent and use the latest technologies that are available today and that open up new productive and artistic horizons. We would venture to say that, after half a century of intense work, this last line proves how at last the general public, too, has recognised Cleto Munari’s role too, not only as an instigator and promoter of new original ideas, but also as a real cultural and artistic figure of Italian contemporary art.